The last couple of classes we have been busily preparing for Easter. The children have been putting together Easter baskets in hopes the Easter Bunny will visit and fill them with lots of fun. The three-year-old class made some white bunny baskets, while the Pre-K class made some colorful bunny baskets. Yesterday we colored eggs in our class. The children love this. I have found that many children don't experience this as often as they used to. We used the wax crayon to make marks on the eggs before we colored them--amazement all around when the eggs came out of the colors and you could see the markings. The room stunk a bit like vinegar all day, but we had a great time. Egg coloring is always fascinating for children. I'm sure that they had a great time! 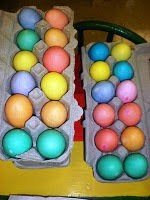 Try using kool-aid (1 packet + 1 cup of water) to dye eggs. I used orange, berry blue, cherry, and lime with my preschoolers this year...looks and smells wonderful!